Is anise seed like catnip for dogs? 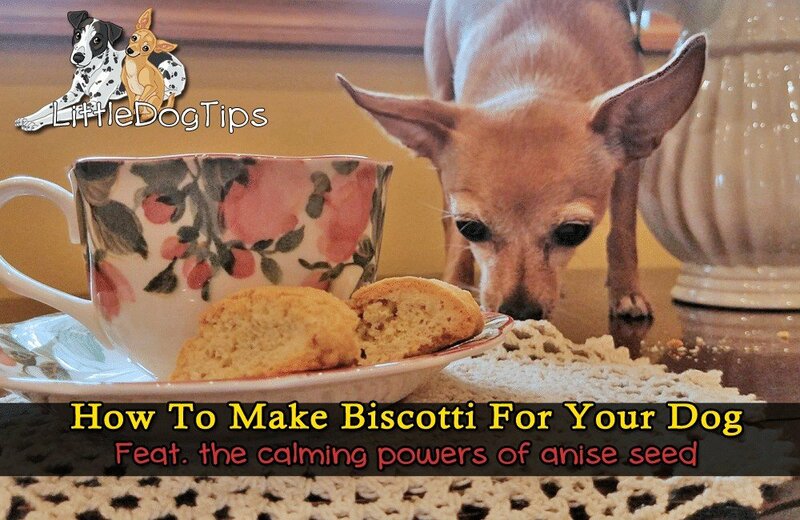 Dogs seem to love the scent of anise – who doesn’t? You’ll instantly recognize the scent of the sweet herb as licorice. Anise seed and extracts are used in many holistic remedies for humans, and is said to help with constipation, anxiety and insomnia. Some dog owners have observed their dogs going crazy over the scent. It can potentially relieve anxiety issues with its mild sedative effects. Like catnip, anise has been observed to have both a sedative AND stimulant effect. Like catnip, it seems to me that it the smell is stimulating to animals, but when consumed, it’s actually relaxing. Now, there’s not a whole lot of solid data on the benefits of anise seed. As with anything, excessive amounts could make your dog sick. But many calming dog treats sold in stores contain the herb, so it’s generally considered safe. Whenever I open my little jar of anise seed, my dogs come running. Of course, they’d hate to miss out on any opportunity for a snack. But when I sprinkle the seeds on the floor, they don’t actually try to eat them. I really think it works, guys. My dogs bark at house guests. They were stressed for two days when my mom’s friend stayed over. As I invited yet another friend of ours over, I was concerned that my dogs would be absolutely overloaded with stress. So, I mixed a quarter teaspoon of anise seeds with coconut oil, allowed the mixture to marinate for an hour, and then allowed Matilda and Cow to lick it up. An hour later, my friend arrived, and my mom returned from the mall with her friend. I expected my dogs to be ultra-stressed. But they didn’t bark their heads off. They barked a little bit. But they finally allowed my mom’s friend to pet them. Then they actually approached her for love, their tails wagging. And they were calmer with my friend than they had ever been, though they still needed some space. This was a huge relief. Of course I don’t want my dogs to be stressed, but I’m also sad and a bit embarrassed when they bark at company. While they do listen when I tell them to “go lie down,” and settle down after a few minutes, to see them finally become truly calm and actually approach guests for attention was absolutely heart-warming. We still have a ways to go, but it’s exciting to have found an affordable, natural way to help ease their nerves. Now, this is just an anecdote. I don’t know if anise seed can help your dog, nor am I entirely sure how effective it can be. But with the limited amount of information we have on most holistic remedies, it’s important to be open-minded, but approach with cautious skepticism. For now, anise seed is a yummy treat ingredient with a whole lot of potential. When I was a kid, my dad would always buy biscotti cookies for me. When I purchased anise seeds to test out their sedative effect on dogs, I was immediately reminded of those moon-shaped cookies that I used to love. I’ve also been trying to find easy ways to administer anise seeds to my dogs before a potentially stressful event. As-is, they release a strong, bitter flavor when chewed. Soaking them in coconut oil helped, but that can be a bit messy. 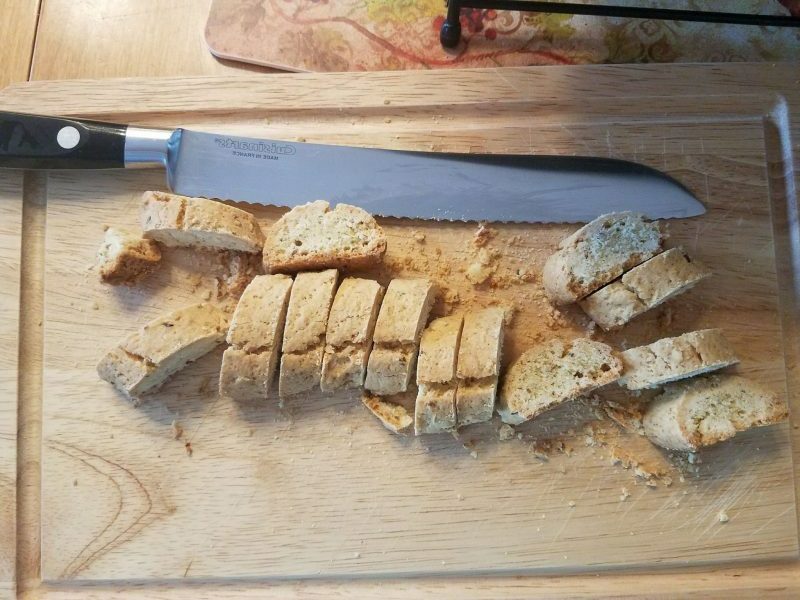 Biscotti means twice-baked. These Italian biscuits are meant to be dry and crunchy, making them more shelf-stable than more moist cookies. 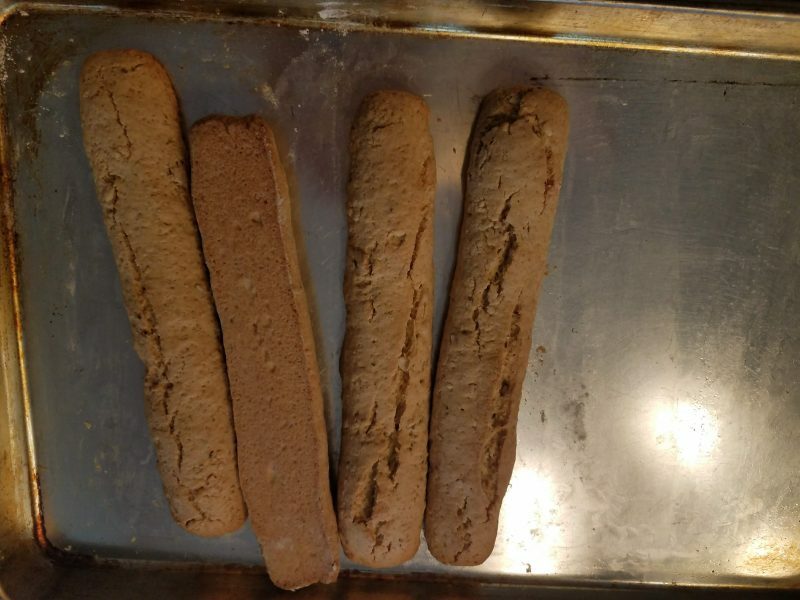 I adjusted a biscotti recipe to make adorable tiny biscuits with less sugar than usual. 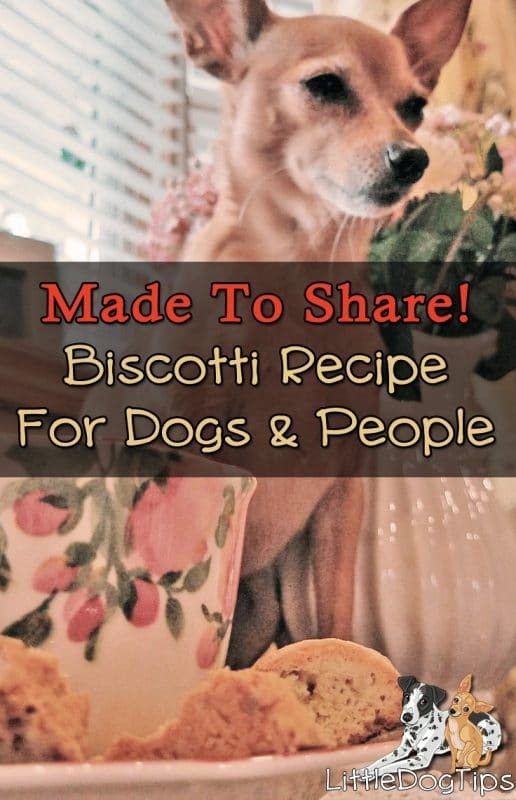 The result is absolutely delicious, perfect for sharing with human family members, too. *Anise seed and aniseed and fennel are sometimes used interchangeably, but they’re all different plants. You want little brown seeds labeled ANISE SEED. In a food processor, grind almonds and anise seeds to desired consistency. You can obliterate your almonds, or allow some chunky pieces to remain. Combine flour, baking powder and salt, plus ground almond/anise seed mixture. Sift or use a wire whisk to make your dry ingredients light and fluffy. Cream butter and sugar. Add eggs. I used a stand mixer, you could also do this by hand. You can also add some more whole anise seeds if you’d like. You should get a soft, sticky dough. Form into a ball, then split into four balls. Dust your hands with flour, then form balls into logs. Place on a greased cookie sheet, or a cookie sheet lined with parchment paper or a silicone baking sheet liner. Your logs should be rounded at the top so when you slice them, you’ll get those half-moon shaped cookies. Bake for 30 minutes. Then, increase oven temperature to 375 degrees and bake for an additional ten minutes or until crust is golden brown. Cooking time depends on the size of your cookies, and might be even faster if your cooking sheet is dark. Cool loaves on a wire rack for ten minutes. Slice diagonally with a serrated knife. 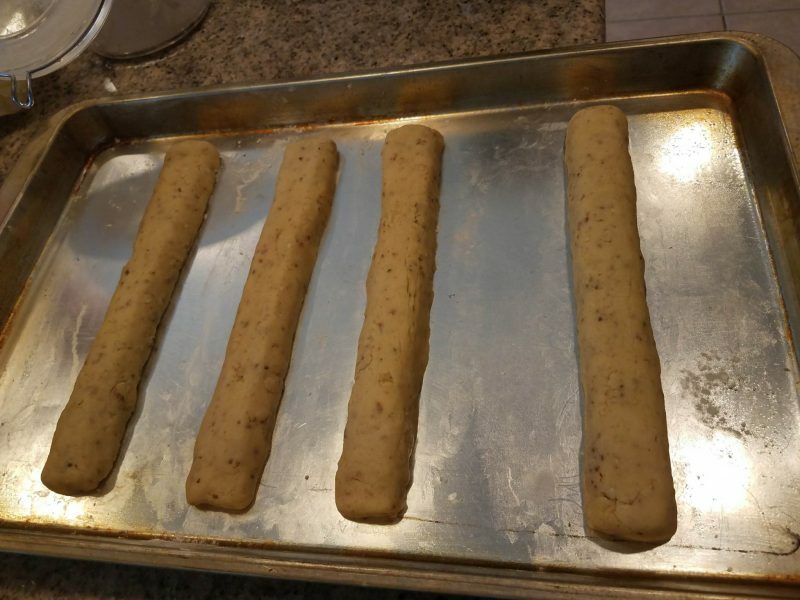 Heat oven to 400 degrees, then bake for 5 minutes on each side, or until cookies reach desired crispness. For extra crunch, shut off oven and leave cookies inside for a few more minutes. Cool and serve! Store leftovers in an airtight container for two weeks, or up to a year in the freezer.